Posted on August 30, 2011 at 16:14. Our new industrial keyboard, featured in the “New Product prototype: Industrial Keyboard” sneak preview back in March, is now shipping. The Industrial Wall Mount Folding Keyboard mounts to any vertical surface and is designed to be used with our Panel Mount Monitors. 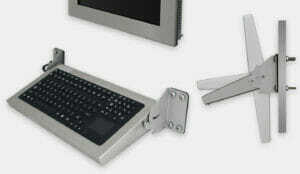 The keyboard folds up or down for convenient storage and has two different typing positions. These new keyboards come with our 3-year warranty and are sealed to NEMA 4 (black powder-coated carbon steel) or NEMA 4X (stainless steel) standards. Short-travel and full-travel keypad options are available. For more details and a full list of specifications, please see the new industrial keyboard’s page.